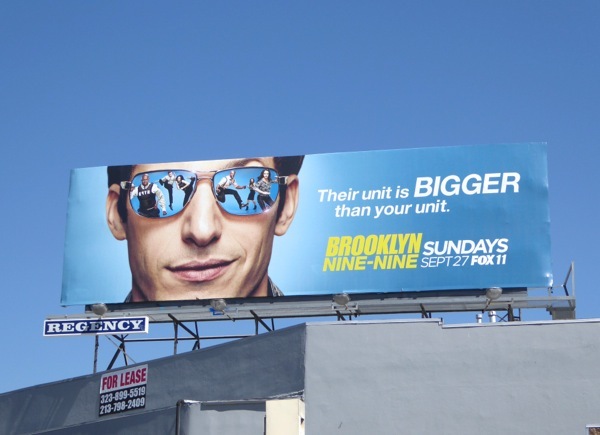 Today as an extra weekend treat you get to enjoy two TV show billboards for the price of one, mostly because someone at Fox thought they could get away with a similar reflective sunglasses ad concept for the debut of Rosewood and the third season of Brooklyn Nine-Nine. 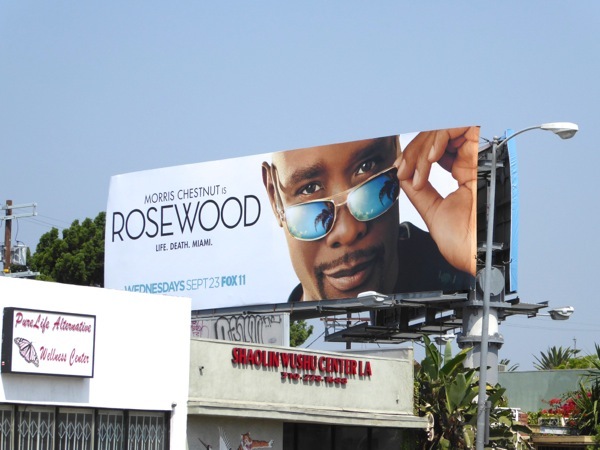 Having Morris Chestnut's shades reflect the Miami palm trees where his new crime show is set, whilst having the rest of the cast of the cop comedy reflected in Andy Samberg's glasses is a fun creative idea, they also feel a bit samey (obviously someone at Fox didn't get the memo). 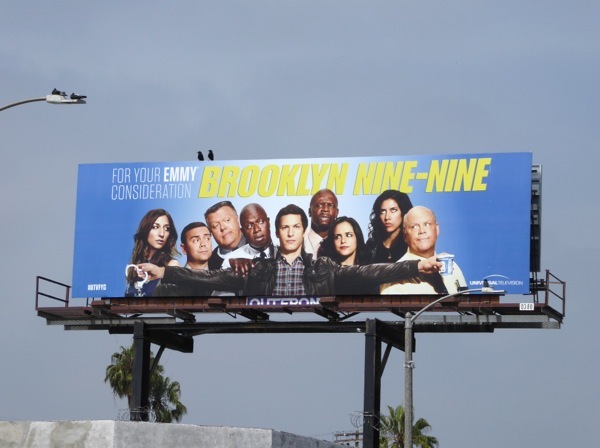 What's more, the similar billboards could be found back to back along La Cienega Boulevard when they were first snapped on August 19 (with another Brooklyn Nine-Nine ad spotted above La Brea Avenue on September 19, 2015). This Fall season 'Dr. 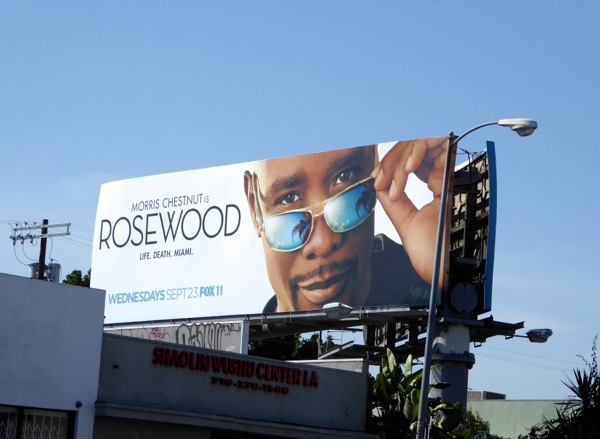 Beamont Rosewood, Jr.' is the new private pathologist in town, helping the Miami PD tackle their most challenging cases in the new medical procedural drama. Meanwhile the guys at the New York City precinct will be getting a new captain in the form of Bill Hader this season, with Andre Braugher's 'Captain Ray Holt' sticking around but moving to the NYPD Public Relations department. 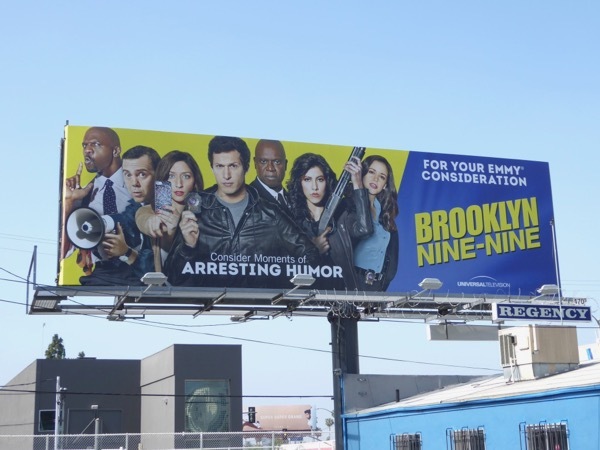 If you're a fan of the sitcom be sure to check out these Brooklyn Nine-Nine series launch and 2015 Emmy billboards, plus if you're an admirer of Morris Chestnut you can see him in these recent movie billboards for The Perfect Guy. 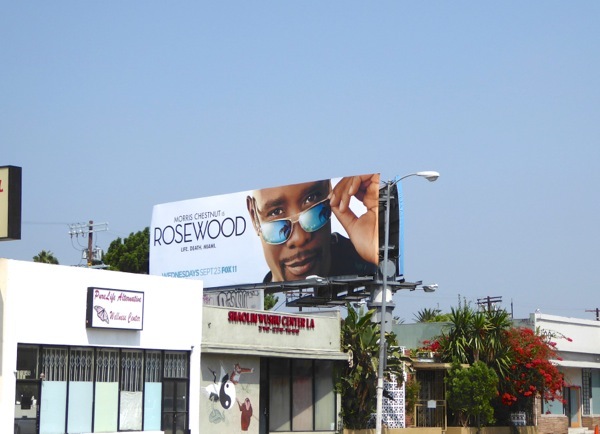 For another television show ad creative using reflective sunglasses, be sure to also check out this Aquarius billboard with David Duchovny. 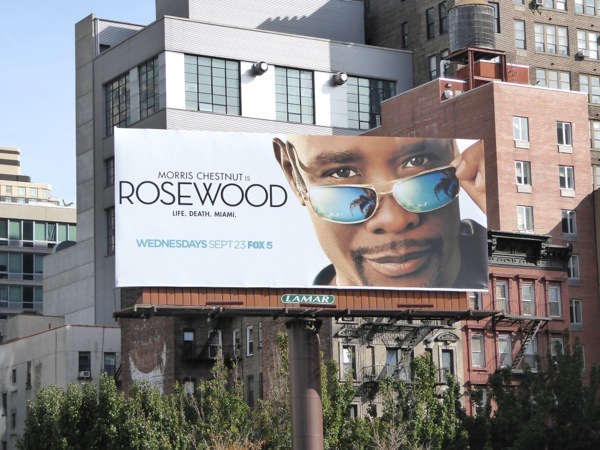 UPDATED: Here's also a billboard for Rosewood spotted along 10th Avenue in New York City on November 2, 2015. 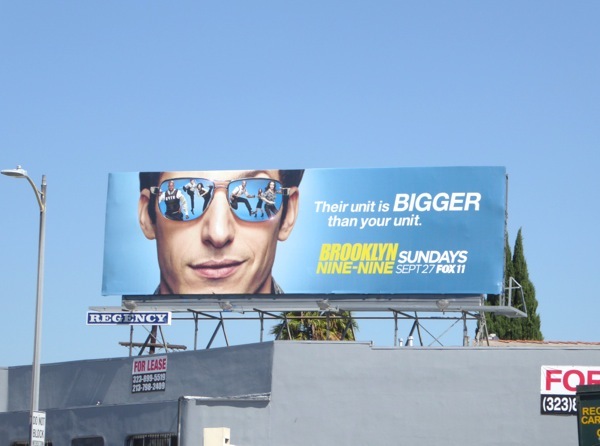 UPDATED: Brooklyn Nine-Nine's third season also gets some Emmy support with this consideration billboard spied along L.A.'s Melrose Avenue on a gloomy June 8, 2016. 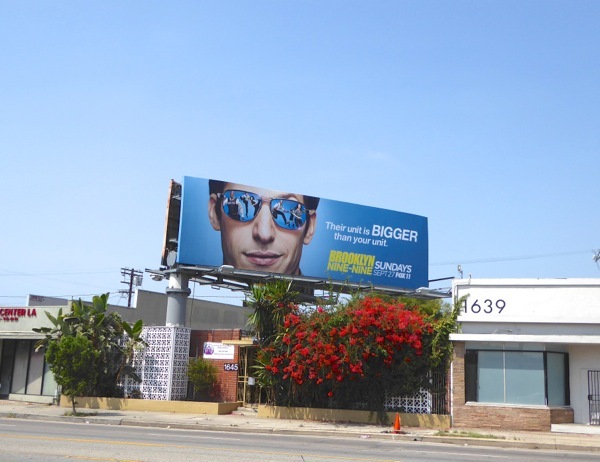 UPDATED: Here's also an Emmy consideration billboard for the comedy's fourth season, snapped along Fairfax Avenue on June 2, 2017.